We are a family run business and we take pride in good professional customer service. 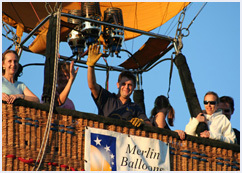 A hot air balloon flight is often a once-in-a-lifetime experience and we can make it a reality for you. Balloon flights are scheduled 7 days a week between April and October. Ballooning packages from £95 are suitable for any occasion, from a birthday, anniversary or a retirement gift to a wedding present. All flights have a duration of around 1 hour from various launch sites over Kent and East Sussex including Hamstreet, Headcorn Airfield, Ashford, Rye, Chapel Down Vineyards in Tenterden, and Brenzett Aeronautical Museum. 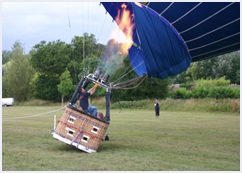 Your balloon ride will be truly magical as you fly over some of the most beautiful scenery in the Garden of England, including the Weald of Kent, with the views of the South East coast. A ride in a balloon over the Kent and East Sussex countryside will guarantee an amazing day for yourself or your loved one and whether it's a special treat or a lifelong ambition, a hot air balloon flight with Merlin Balloons will be remembered forever. Merlin Balloon Flights now fly 16 passengers in the beautiful iconic big red Virgin Balloon. We offer a range of Flight vouchers that are sold individually and are valid for either 12 or 18 months from the date of your choice (subject to availability). Flight vouchers can be booked for a specific flight date or issued open-dated, making it a unique present for someone special. Merlin Balloons are now in partnership with Virgin Balloon Flights operating from the same launch sites within Kent and East Sussex area. 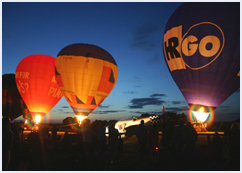 You can now purchase flight vouchers from Virgin Balloon Flights to enjoy the experience of flying in a hot air balloon. Why not share your experience with friends and family? Whether you're planning a family get together or a corporate event, we can organise the right package for you. Balloon flights can make special occasions even more memorable. So, if you're thinking of popping the question or buying a gift for a birthday, anniversary or as a unique wedding present, Virgin Balloon Flights can make your dreams come true! 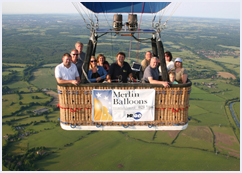 To book a balloon flight in Kent and East Sussex you can call Merlin Balloons Booking Office or you can book and pay online at your own convenience. The Virgin Balloon Flights team and balloon crew look forward to flying with you in the very near future.